Chris is a graduate student at Western University. He holds bachelor degrees in medical sciences as well as computer science. He is currently studying his masters in computer science, with an interest in virtual/augmented reality and introducing computer science to students at a younger age. Do you see the odd numbers 1, 3, 5, 7, 9, 11, 13 and 15 hiding inside the square? Here’s the matrix with the backpack – just two pieces. Once you have the matrix created, you’ll need to connect it to the Uno. 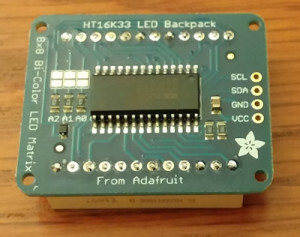 The matrix comes with a four (or maybe six) pin header that you can use to pin the matrix down to the board and then solder – I chose not to solder it so that it is easier to remove in the event that we want to use the board for something else. Before connecting the matrix, make sure that the Uno board is powered off. The matrix has four inputs – two are for power (positive and negative). 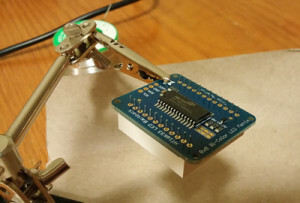 The + connects to the 5V on the Uno, while the – connects to the ground. The other two are the clock (CLK), shown as a C on the top of the board, and data (DAT) input, shown as a D on the top of the board. The clock connects to the A5 analog on the Uno, while the data connects to the A4. The Uno should come with a USB cable that you can plug right into it to upload the data. Simply plug the cable into the Uno and you’ll be good to go! You should see a few lights on the board when you plug it in. You can check that the library is installed the same way we did for the Adafruit_LEDBackpack library – look inside Sketch –> Import Library and make sure Adafruit_GFX is listed there. This is what the board comes with by default. Let’s upload it just to make sure it works. Before we do the upload, we need to make sure we’ve selected the right tools. 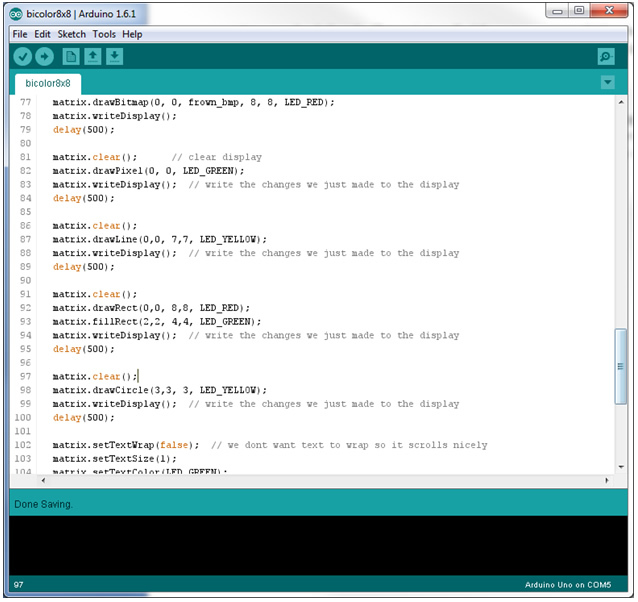 Under Tools –> Board, make sure Arduino Uno is selected as the board type. 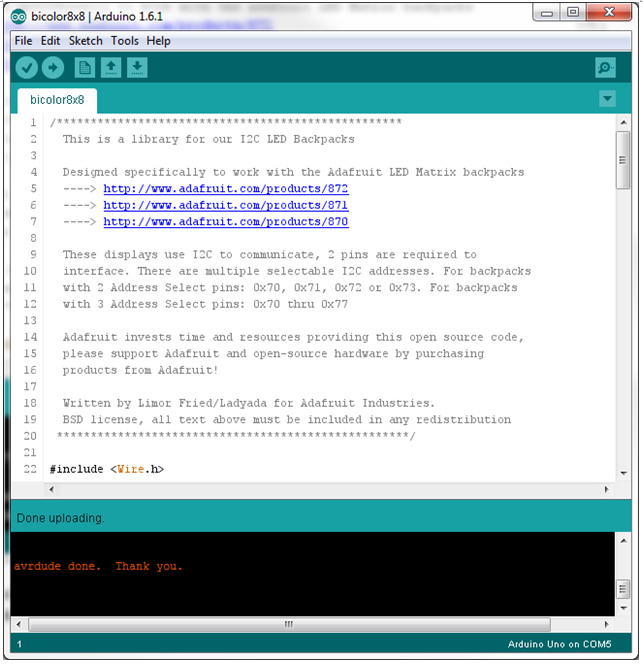 Also look under Tools –> Ports, and make sure that you select the one that says (Arduino Uno) in brackets. Now we can upload the code to the matrix! Click on the arrow next to the checkmark at the top – this will upload the code onto the Uno. Once it tells you the upload is done, the matrix should reset and perform its basic routines. Now we know how to get code from the computer onto the Uno! These two lines of code initialize the matrix and tell the Uno its address so that it can communicate with it. Make sure you keep these two lines of code in so that the matrix works! Can you guess what this code will do? 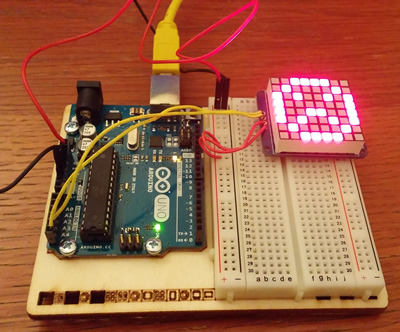 The drawPixel function simply lights up one of the pixels with a colour. The pixel is given by an (x, y) coordinate, with (0,0) being the top left. 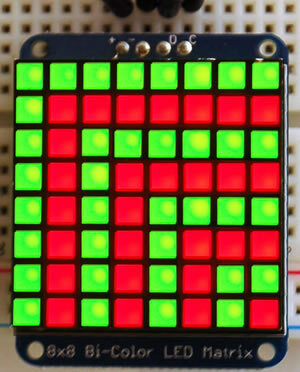 The colours are specified with LED_GREEN, LED_RED, and LED_YELLOW. matrix.writeDisplay() tells the matrix to show whatever the code has made it do – this line is crucial to making the matrix display what you want. Don’t forget to call matrix.writeDisplay() whenever you want it to show something! As the name suggests, the drawLine() function draws a line from point A to point B. Point A is given by the first two numbers as x and y coordinates, and point B is given as the next two numbers, again as x and y coordinates. The colour is given last. As always, remember to call writeDisplay() after drawing everything! 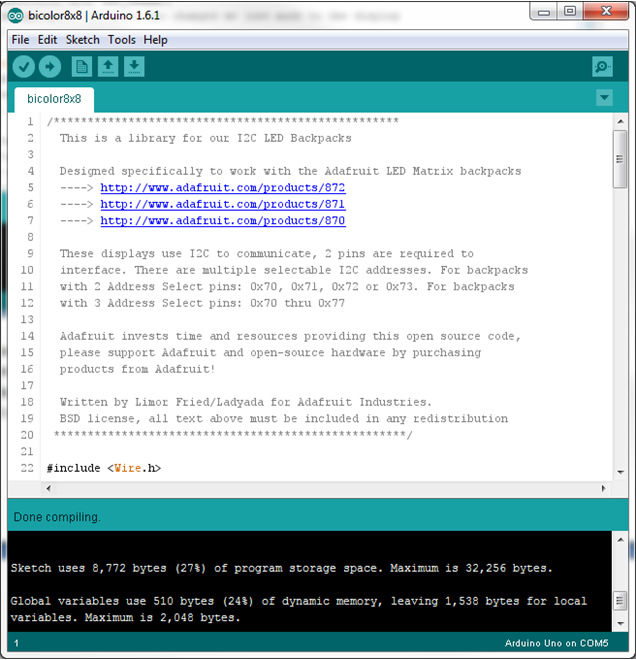 You’ll notice that in the code, we now call matrix.writeDisplay() more than once. The delay function makes the Uno wait for the specified amount of milliseconds before continuing on. What we’ve done here is told the matrix to show something, and then told it to wait a second before showing the next thing. This gives us the changing pattern that you see on the matrix. Remember that once a pixel is turned on, it will remain on until you tell it to turn off. 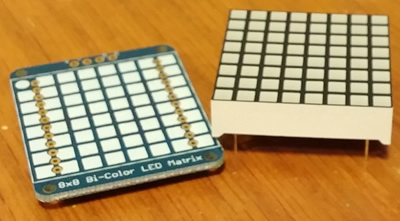 In the sample above, we used the matrix.clear() function to turn off all of the pixels, but what if you only want to turn off a select number of pixels? It’s done the same way as turning on the pixels, but instead of giving it a colour (e.g. LED_GREEN), you tell it to turn off (LED_OFF). Think of it as using white-out – you’re drawing the pixel with the ‘off’ colour. Here we added the function writeAndWait(). All it does is tell the matrix to writeDisplay(), and then delay(1000). The ‘void’ in front of the function name means that it does not return any values – you can create functions that also return something. In this case, we don’t need it to return anything, just execute a few instructions. Notice now that there is something inside those brackets. Whenever we want to call this function, we have to give it an int (a number). This number represents how long the Uno should wait before continuing on. This allows us to change the delay without changing the function – you’ll notice that some of the writeAndWait() function calls only have 500 milliseconds of delay instead of 1000. Notice how the power for the matrix now comes from the side columns instead of directly from the power source. We need the power to complete the circuit for our button. Complete the circuit as shown in the picture above. 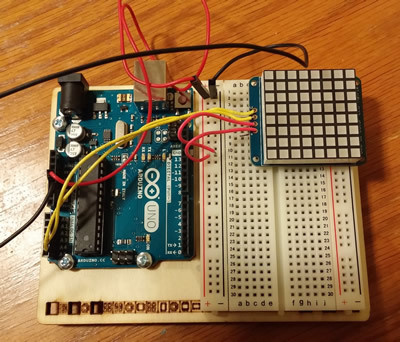 If you’re not sure exactly how it works, the button circuit is taken exactly from project 2 of the Arduino projects book (the spaceship interface). 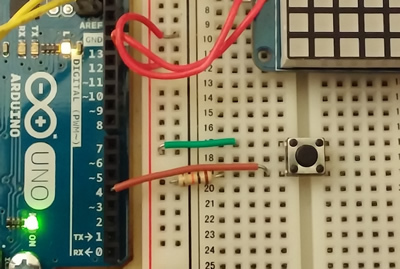 Make sure that the wire from the circuit to the board goes into a digital pin. The digital pins are those numbered without the ~ in front of the number (2, 4, 7, 8). The pins with the ~ are PWM pins (also digital, but give an analog input/output). Think of digital as a light switch (on or off) and analog as a volume knob (low to high). 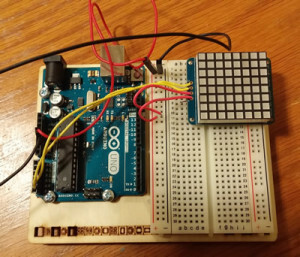 This tells the board to read that pin as an input, and allows us to access its reading. Great, so now how do we actually make it do something? It is important to understand what is happening inside the circuit with the button in it. 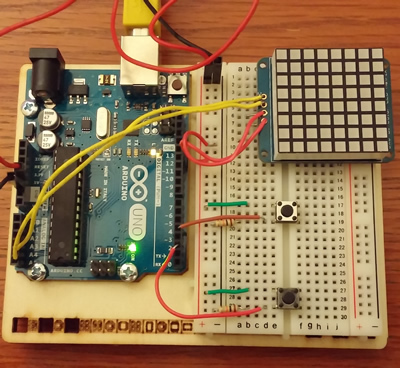 The circuit is not complete when the button isn’t pressed, so the input will read as low (there’s no voltage). When the circuit is completed the voltage can go through the circuit to the input, so it will read as high (there’s voltage here!). Whenever the button is pressed, the Uno will read the input as being high. First we need to take the reading from the input and store it somewhere (in this case we store it in a variable called input). 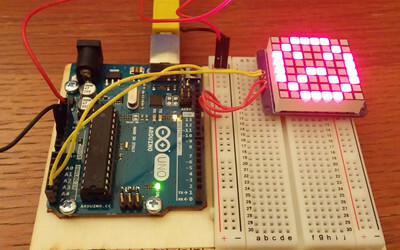 The reading is done using the digitalRead() function – just give the number of the pin, and it will tell you if it is HIGH or LOW. Then we have an if statement which says, if the reading is high, then I want you to draw the pattern. This button acts like a ‘play’ button – it starts the pattern up when it is pressed. You can add as many buttons as you want (or can fit onto the board). Here’s an image of two buttons – what other things could you control with a second input?